Fire legend Cuauhtemoc Blanco was in attendance for tonight’s match and addressed the media before the game. 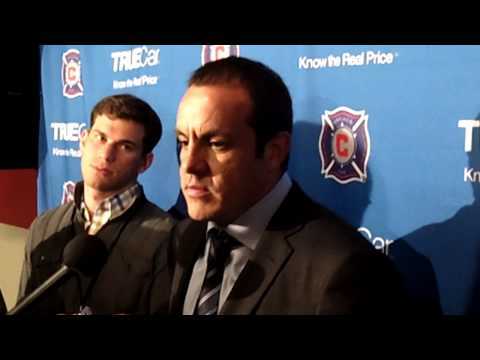 Blanco talked about being invited back for the Fire’s 15th Anniversary and his time in Chicago. It’s official. Cuauhtemoc Blanco will not be returning to the Fire this season. Blanco confirmed on live televsion (Fox Soccer Espanol) this evening that he will be playing for Irapuato. According to this article over at SBI, Cuauhtemoc Blanco is still weighing the offer from Irapuato and no deal has been finalized. This jibes with what I’ve been able to gather from inside Toyota Park. There have also been rumblings of additional player acquisitions although no names have surfaced yet. According to this article Cuauhtemoc Blanco has chosen to play for Mexican second division side Irapuato. Blanco made no mention of Irapuato during his radio program yesterday although the deal was reportedly reached last night. The article does mention an offer on the table from the Chicago Fire.